Are you looking for ways to make your eyes look bigger and more vibrant? Here are a few tips and tricks that will help. I have very small eyes and am always trying to find ways to make my eyes look bigger. I’m also getting, ahem, older and those fine lines and wrinkles have shown up under my eyes and I believe they’re here to stay. If not taken care of, they make me look very tired. 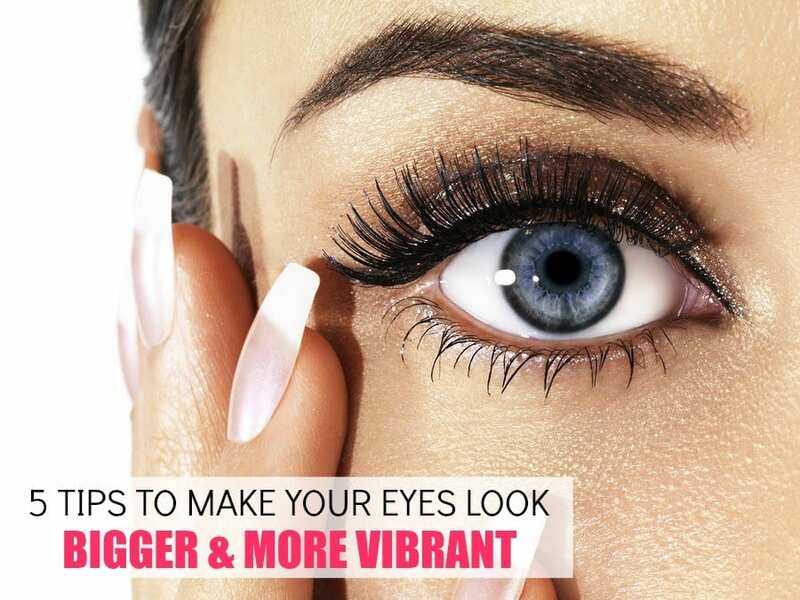 Here are 5 tips to make your eyes look bigger and more vibrant. Taking care of your brows and keeping them groomed does wonders for how your eyes look. I’m always amazed after I get them done how much brighter my eyes appear. Sometimes I do them myself and sometimes I go to a salon. It just depends on how much time and money I have when it’s time for some much-needed eyebrow grooming. If you do them yourself, get a good pair of tweezers and don’t go overboard. You can always tweeze a bit more if you need to, but you can’t put them back if you tweeze too much! Just follow the natural curve and tweeze the ones that are out of line. You can also get an eyebrow kit which will have all the tools you need for creating your perfect eyebrows. I’ve heard really good things about this one and after reading all of the reviews, I just might try it. No, I am not advocating plastic surgery here. I’m recommending a product that help ‘fill in’ those fine lines and wrinkles. If you have issues with puffiness, bags or wrinkles under your eyes, you know as well as I do that it makes you look older and tired. I don’t want to look older and tired. I want to look my age (who am I kidding…I want to look younger) and awake! 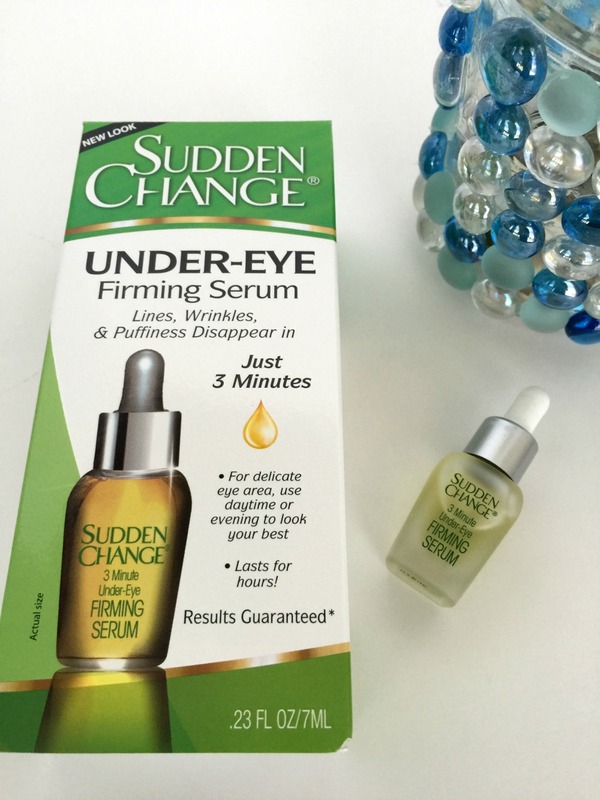 Sudden Change gives you that temporary eye ‘lift’ you’ve been looking for. To use this product and get results, you need to start with a clean face. You can’t even use a moisturizer under your eyes because it won’t work properly. Now that you have a clean face, smooth two drops under both eyes, from inner to outer corner. And then wait for 3 minutes. Do not smile. Do not frown. Just wait. You can also use this with your foundation, which is what I’ve done before and is my preferred method. Just put two drops in the palm of your hand, add a dot of foundation and mix with your finger. Then apply. Don’t wait too long for this process or it starts to dry in your hands. I heard about this trick years ago and swear by it! For the corner of your eyes, you can dab a little white eyeshadow with your pinky in the corner of each eye. For right under your brow, use either a brow highlighter pencil or a white shadow and apply it right under your brow on the brow bone. I think once you try this, you’ll love what a difference it makes in how bright your eyes look. You can see in the photo above how Kristen Bell has some highlighter going on in the corner of her eyes. It gives her such a fresh faced look. Lately, to save time, I’ve been using the brow highlighter for both the corners of my eye and brow bone. This highlighter pencil from Jane Iredale can be used on the eyes, lips, and face. This is another trick I’ve been doing for years and I definitely notice a difference if I go with a lighter shadow. I was reading about the reasoning behind why this works, and it’s because light colors help bring objects forward, while dark makes them recede. If you have small eyes, you do not want any receding going on. I like to have an eyeshadow palette that has both light and dark colors available to me. Every once and awhile I’ll do a smokey eye for special occasions and this palette gives me all of the options I need. This simple step can do wonders for making your eyes pop and it helps out your mascara! When your eyelashes are flipped upwards, it opens your eye area up. It creates the illusion of bigger eyes. This rose gold eyelash curler is not only downright pretty, but it does the job really well. It also comes in gold or platinum. Are you ready to implement some (or all) of these tricks to help make your eyes look bigger and more vibrant? Enjoy experimenting with these different tips! Previous articleHave You Ordered Your Student’s Graduation Announcements Yet? It’s Time!